About workshops: Participants learn Stoic techniques of working with the mind and get insight into the life and philosophical practice of the eminent Stoic and Roman Emperor Marcus Aurelius, exploring his way of thinking and acting. According to the motto of Marcus Aurelius – Do not be angry at the course of events. They do not care about your anger – they learn to care for inner peace, regardless of the circumstances. According to stoicism, the quality of our life does not depend on the events that happen to us, but on the way we interpret them. We have inborn psychological immunity. However, it can be weakened by the mistakes of thinking and the way in which we translate reality. 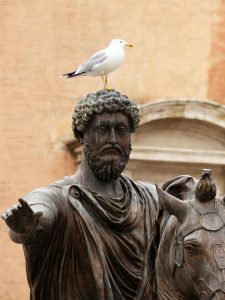 Based on these discoveries, stoic philosophers achieved peace and inner strength, and in the case of Marcus Aurelius, also leadership effectiveness. Stoic exercises, such as the controlling inner speech, lead to deep tranquility even in times of uncertainty and change. The workshop teaches how to apply this method to our daily life. The workshop takes place in the Parco dell’ Appia Antica in the city of Rome, a place full of ancient ruins, where one can still feel the presence of old Stoic masters. Via Appia was the most important and also oldest of all Roman roads. It was called Via Sacra (Sacred Way). h. 18.00-20.00 – Introduction to the life and philosophy of Marcus Aurelius, a meditation session inspired by the philosophy of this Roman emperor. 10.00-12.30. Analysis of the most therapeutic fragments of “Meditations” by Marek Aureliusz, written exercises, discussion. 12.30-14.00 Lunch break in a nearby restaurant or pizzeria. 14.00-16.00 Walking meditation in Rome. 16.00-16.30 Coffee break, free discussion. 16.30-18.30 Understanding the deep foundations of Stoic philosophy: lecture and exercises. 10.00-12.30 Understanding the deep foundations of Stoic philosophy: lecture and exercises. 14.00-15.30 Designing an individual stoic program for everyday life. After 4:00 pm. 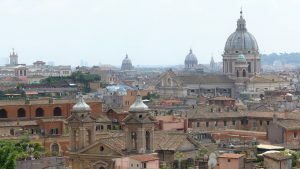 An informal walk together in the footsteps of Marcus Aurelius in Rome (if someone wants to take an individual walk, they will get exact instructions on the route).